Previous work has shown that there is a small solvent effect on the electron spin resonance spectra of nitroxide spin labels. 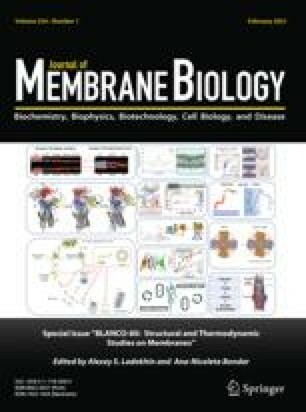 The aim of this paper is to develop a semiquantitative treatment of the solvent effects and to use this treatment to estimate the shape of the hydrophobic barrier (i.e., polarity profile) of lipid bilayers. In this semiquantitative treatment of solvent effects, the total effect on the isotropic14N coupling constant, ΔA, is expressed as a sum of terms associated with van der Waals interactions, hydrogen bonding, the charged double layer of phospholipid polar groups and the membrane potential. The magnitude of ΔA as a function of the electric field is estimated with Hückel molecular orbital theory and, independently, using the Onsager model. With these relations, estimates of the relative importance of the various solvent effect terms are obtained from accurate ESR measurements on dilute solutions of di-t-butyl nitroxide in thirty-three solvents and calculations of the electric field produced by the charged double layer and the membrane potential. To estimate the shape of the hydrophobic barrier of lipid bilayers, fatty acids andl-α-lecithins with doxyl (i.e., 4′, 4′-dimethyloxazolidine-N-oxyl) labels bonded to various positions along the lipid chains were diffused into phospholipid vesicles and membranes (from the calf liver microsomal fraction). The shape of the hydrophobic barrier is plotted as a polarity index operationally defined in terms of the ΔA of the lipid spin labels. The effect of the charged double layers is less important than water penetration except when the spin label is within a few Angstroms of the charged groups. Any effects of a membrane potential on ΔA are insignificant. A comparison of ESR spectra indicates that significant water penetration into the bilayer occurs in both the pure lipid bilayers and in the membrane preparations.